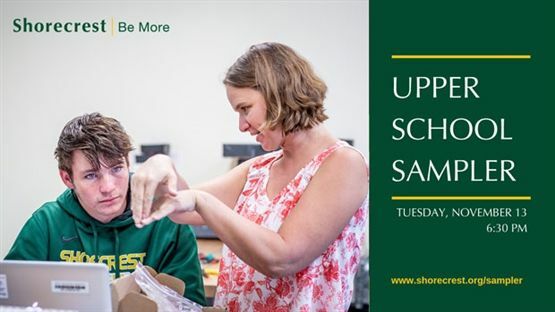 Parents of current Shorecrest eighth graders and prospective incoming Upper School families are invited to join the Admissions Office and Shorecrest Administrators for the Upper School Sampler, Tuesday, November 13, 2018. Hear from administrators, college counselors, faculty, parents, and students about the exciting opportunities that Shorecrest 9th graders have at their fingertips. Learn about Upper School’s signature programs including the Global Scholars Initiative, the Center for Medical Sciences, and Service Week, student leadership opportunities and more. Please RSVP by November 9 online at www.shorecrest.org/sampler.